There is one Saturday in September when I miss the races and head off to the footy. Grand Final day. The Swans versus the Hawks. The battle of the birds. And they even had another bird, a wedge-tailed eagle, perched on top of the southern stand to scare off the other birds, the wretched seagulls! I have seen some memorable grand finals. In 1962 as a little tacker I watched the Bombers from the old Grey Smith stand on a members’ ladies ticket. We used to bang on the timber floor with our feet after each goal and create a tremendous racket. In 1965, the year John Somerville was laid out by Duncan Wright, I was in the outer in standing room perched on four empty beer cans. In the 80s, the back-to-back years, I was still a restricted member and watched it on TV, but managed to see the prelims live. 1990 was probably the worst year when Terry Daniher ran the length of the ground and laid out a Collingwood player. Fights broke out in the members around me! Essendon lost the fights in the members, on the ground, and lost the grand final. 1993, the year of the Baby Bombers, was probably the most memorable, when Dean Wallis laid out Mil Hanna right in front of us, and Michael Long danced around the middle of the ground. 2000 was also good, James Hird showed his silky skills, and Dean Wallis probably won it for them again. The lowlight was the one that got away, the prelim in 1999, when Carlton did us by a point. Today my brother and I missed out in the ballot for tickets but managed to find a good standing room spot. I wasn’t sure that I could stand up for five hours, until I realised that I spend all Saturday afternoon walking or standing anyway! 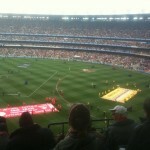 It was an exciting game and I’m glad Essendon wasn’t involved as I don’t think my heart could stand it. A point the difference in time on! 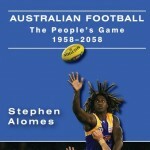 My mate, Stephen Alomes, the footy professor, has written a terrific book about the game and where it is headed. It even has a terrific endorsement by Sheeds: “If you love Australian football, its past, its present and its future, then you have to read this book.” If like me, you like the footy, grab yourself a copy from Walla Walla Press. A beautiful day, fine, mild and sunny. So good that I said goodbye to winter, discarded the long johns, and dusted off the straw hat. And The Missus has been busy fashioning a hoof pad for my poor, sore heel. Spring is in the air. 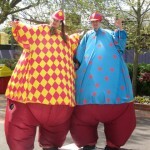 You can tell because the entrance is guarded by two fat ladies and there are scads of people here. Maybe the races should be free every week? A quiet day out the back, although there must have been 200 people lining the parade ring for the Underwood. Shenzhou Steeds took my eye in the Naturalism with his sucky blanket. Do you remember Linus in Peanuts? The horse just ran out of puff in the finish for fourth. I ended up with a couple of nice collects on Veewap and Molto Bene and a hopeless loser, who shall remain unnamed. But good to be positive. Third up, I think my eye is now officially in. But the body is still a bit battered and I pulled up a bit sore. Might have to try a concussion plate. 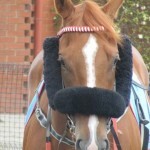 In the first race my attention is immediately drawn to Forget who is sporting the astounding combination of winkers and nose roll. This obviously calls for an early deployment of the camera. You would have to say that this horse’s vision is quite restricted. The horse proceeds to the barrier resisting the jockey. Quite clearly, a horse to forget. And what’s more, it is the favourite, at $2.10 the win and $1.10 the place? You would have to be joking! I would have, should have laid it, but I didn’t. Brain snap. I forgot Forget and became distracted and preoccupied with the terrific appearance of About Square and decided to back it instead. About Square finished a dismal last and Forget just managed third place. You would have to say, a very poor start. 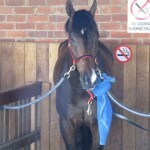 A recovery of sorts with Platelet in the fifth, beautifully relaxed, and a standout at $3.00 the place. Snitzem had the flowerpot in the stall which fills me with dread. 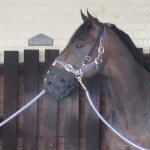 That good horse, Weekend Hussler, used to have a flowerpot. I simply don’t trust horses that bite! I think Margaret McDonald still has scars from the Hussler. And then the race I was saving myself for, the mares, but I undid my good work and gave back all my winnings on Booklet, who finished a miserable and pathetic tenth. I was feeling a bit that way too. I didn’t even make it out to the stalls or the parade ring for the last and collapsed onto the leather lounge in the Octagonal Bar. Second up from a spell. A bit flat. I think I’m still physically and mentally adjusting to life as a horse watcher. And I’ve got a blooming heel spur which is giving me hell and restricting my walking ability. So I went home early and missed the last. It must be the first time in umpteen years that I have left a racetrack when there is a race yet to be run! Things can only improve, third up. The weather is miserable with a piercing wind and strafing showers interrupted by occasional bursts of sunshine. A typical Melbourne spring. I’m not planning much betting action as it always takes a couple of weeks to get my eye in. But I’m interested to lay Mosheen who has been spruiked in the press, but is just back from a throat operation and is wearing the glue on shoes. If it’s less than $2.00 the place I’m going to lay it all day. And Racenet have sent me a horse alert about I’m Jake, who I’ve noted is a possible stringhalt horse. 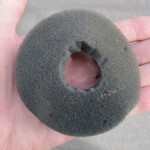 Mosheen appeared with the glue ons. Some of the newer versions are impossible to detect because they don’t have the tabs on the side of the hoof, but Mosheen’s were quite obvious. A quick check on Betfair showed $2.96 for the lay which was quite a shock when I was expecting the horse to be favourite at $1.50 the place. Clearly, nobody likes the glue ons! The horse finished thirteenth. And I’m Jake finally arrived but every time he walked past me he picked up his gait. I managed a small video. 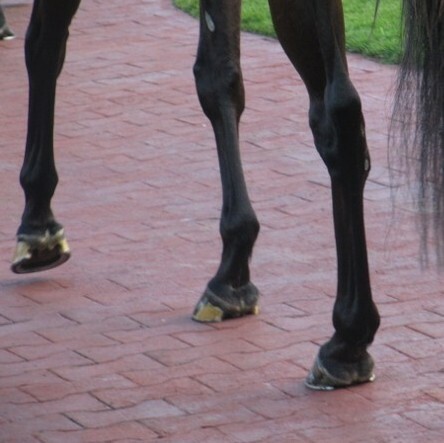 Stringhalt is a most unusual exaggerated flexion of a hind leg, probably made famous by the Godolphin horse Pugin in the Cup some years back. I’m Jake’s seems to be intermittent and not as pronounced. I ended up looking at six races and having two bets. Hi Belle and Smokin’ Joey, both old favourites, and both with lovely calm temperaments to cope with the unsettling wind. Hi Belle came steaming home for second at $2.50, but Joey got lost at the back and then blocked for a run, but still came home well. So slightly up for the day. I was a bit tired by the end and my beautifully warm body from Queensland had been chilled to the bone. But as everyone keeps reminding me, it’s better than being in the bin.